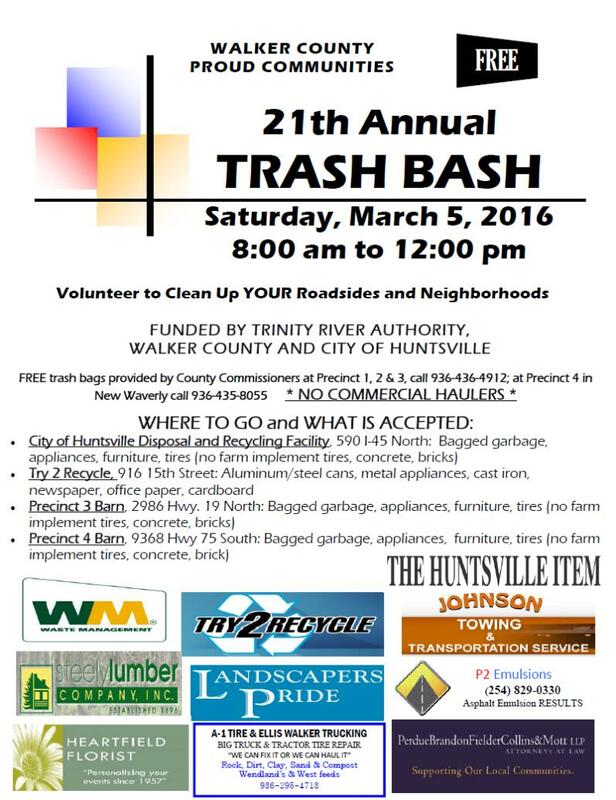 Walker County Proud Communities (WCPC), consisting of members from Walker County, the City of Huntsville Solid Waste and Recycling, the Texas Forest Service, Master Gardeners, and local businesses, is sponsoring the 21st Annual Trash Bash on Saturday, March 5, 2016, from 8 a.m. to noon. Annually, over 400 vehicles come through the four drop-off sites (the City of Huntsville Disposal and Recycling Facility, Try 2 Recycle, and Walker County Precinct 3 and 4 Barns), with over 150 tons of garbage, tires, and metal. Brush received is composted. The drop-off sites do NOT accept farm implement tires, concrete, bricks, burn barrels, junk vehicles, liquids of any type, or vehicle batteries. Over 100 volunteers from the Walker County Sheriff's Office, Walker County Community Supervision and Corrections, Master Gardeners, Walker County Environmental Enforcement, Walker County Commissioners offices, Try 2 Recycle, Waste Management of Houston, and the City of Huntsville Disposal and Recycling staff assist during the multi-site event. This year's Trash Bash sponsors include Waste Management of Houston, Try 2 Recycle, Johnson Towing & Transportation, The Huntsville Item, Steely Lumber Company, Inc., Landscapers Pride, P2 Emulsions, Heartfield Florist, A-1 Tire & Ellis Walker Trucking, and PerdueBrandonFielderCollins&Mott, LLP. The purpose of Trash Bash is to provide citizens an opportunity to dispose of materials at no cost and to prevent illegal dump sites. The annual E-Recycling Day will be held on April 2 to dispose of electronics, small appliances, and other "plug-in" items. Walker County Proud Communities includes the Texas Forest Service, Walker County Commissioners, Walker County Master Gardeners, the Walker County Judge's Office, the City of Huntsville, and private citizens. The Texas Forest Service provides the seedlings for the annual tree sale and the Master Gardeners provide tree planting tips to buyers. The Tree Sale is the only fundraiser to help with expenses related to the Trash Bash. WCPC meets approximately nine times per year to discuss the environment and promote awareness.